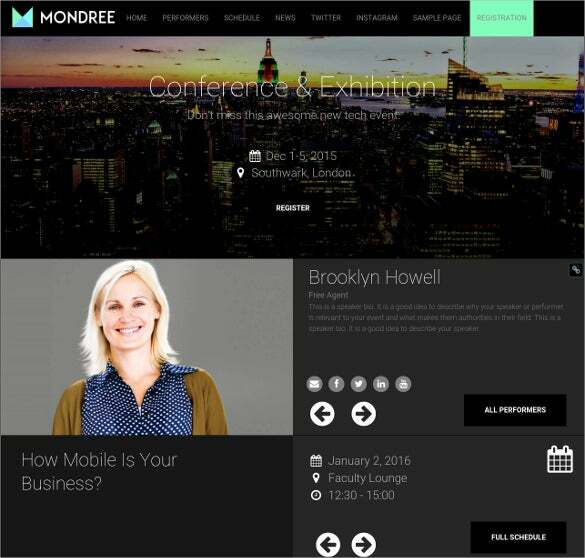 Provide your online customers with a great site experience and keep them hooked with these event WordPress theme options. 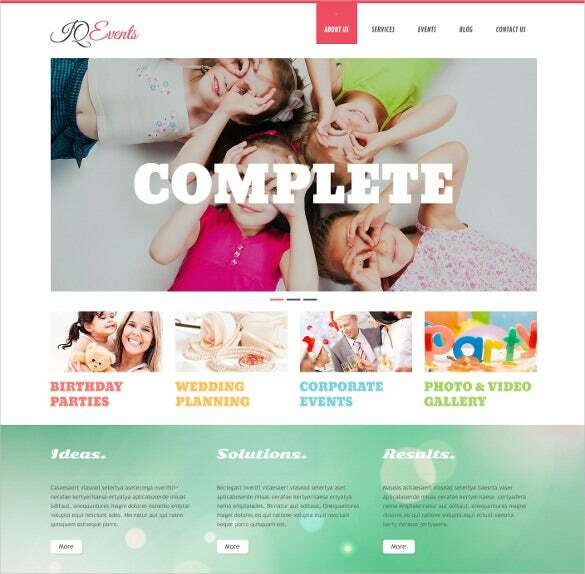 They are fully editable and customizable with flexible options to modify your site for wedding planning, or any other event manangement services.you may also check Event HTML5 Themes. 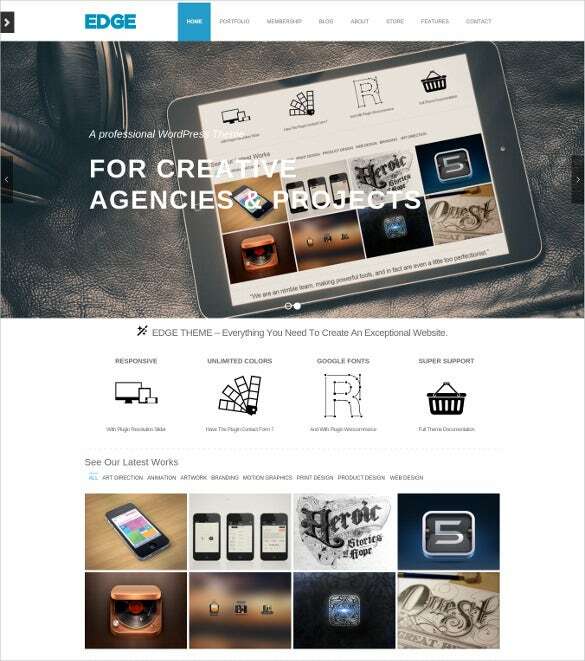 You are getting a fresh and cool theme here that looks beautiful with a rich color backdrop. The cute illustrations duly complement the overall funky & amusing feel of the theme. 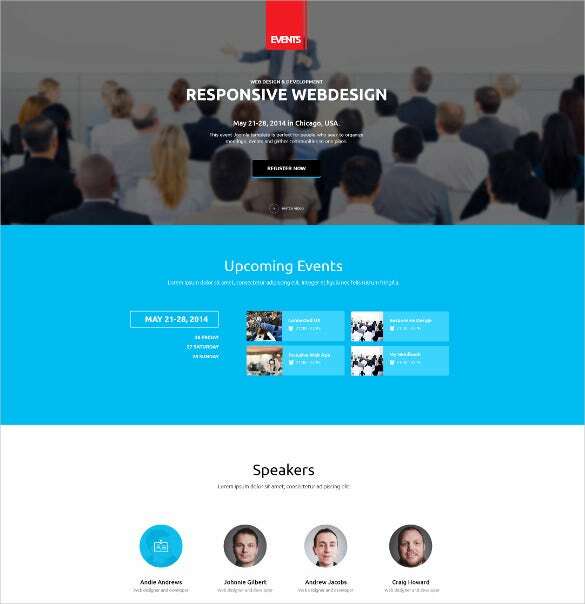 It’s a fully editable, 100 percent responsive theme that comes with more than 80 shortcodes & multiple color choices. The overall theme comes with a classy urbane effect which is sure to grab attention. It opens with a big banner with a countdown timer. The space below will feature your latest post. 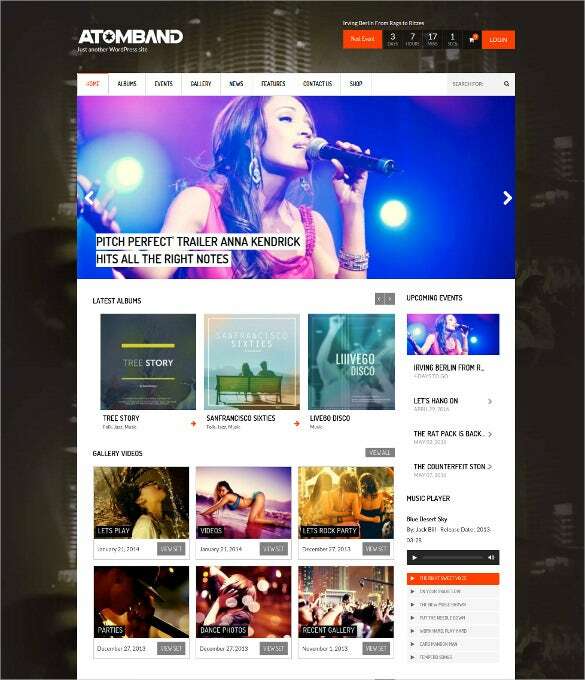 The theme here comes with different homepage variations and RTL directions. It’s the absolute theme for any event management website. 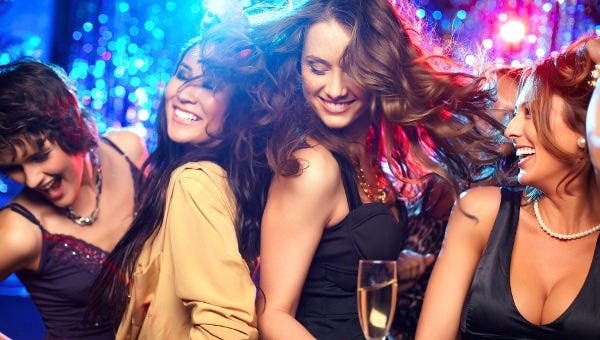 You are getting a gorgeous and colorful theme and the joyful pictures sets the mood for party immediately. You can include some basic text but the theme mostly conveys through pictures. 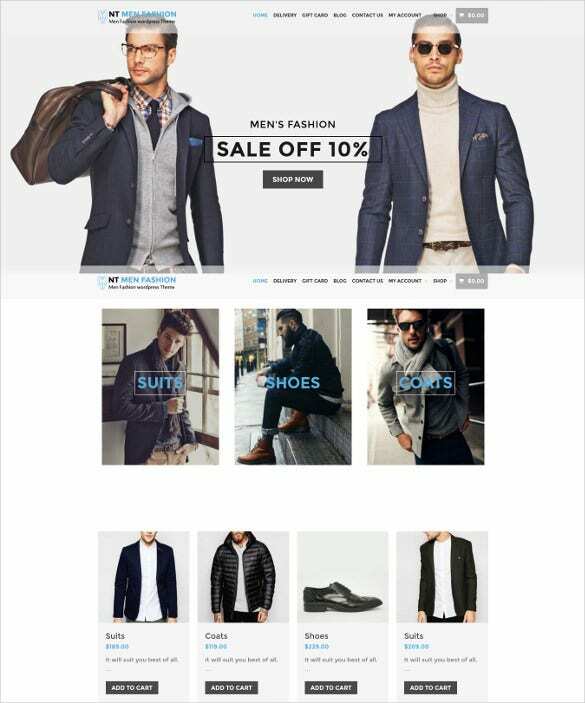 It’s a fully responsive theme with jPlayer jQuery plugin. You are getting a robust admin panel and events calendar. 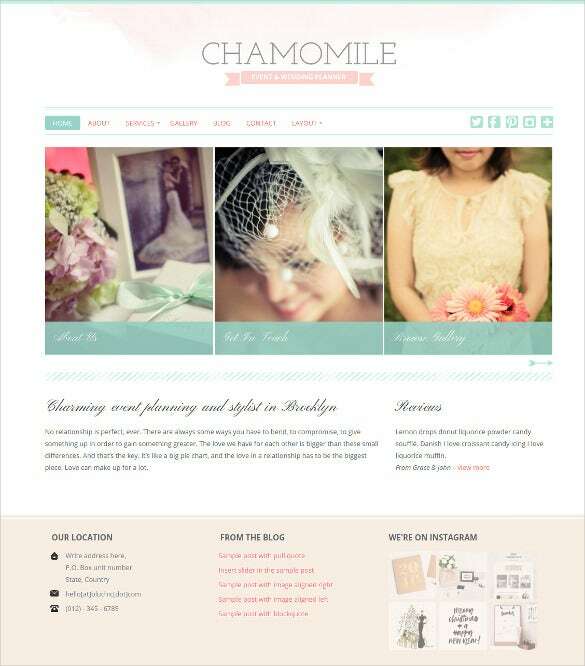 Check out this very chic-looking theme. It features excellent shot and has a great funky green color running through at the top. There is also a big banner given wherein you can fulfill your event’s advertising needs. The files on this theme template are fully-editable, and the template is fully-responsive and has 80 short codes. 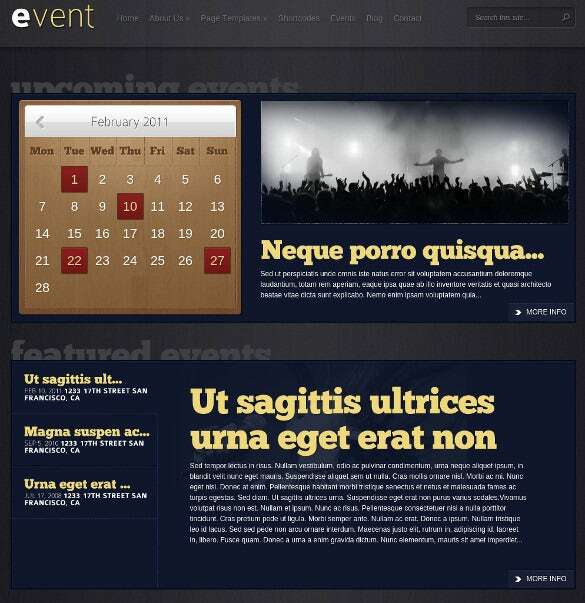 Here is one more very good-looking event theme template option. There is a big banner which pop up first when you open the site. The banner is a slide banner and there’s also a countdown timer attached with it. 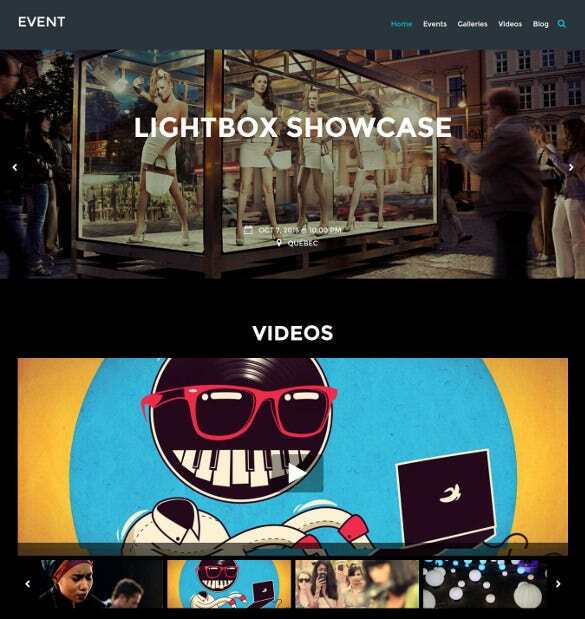 The sections on the template are divided – covering different aspects of the event – and there is a menu bar at the top. 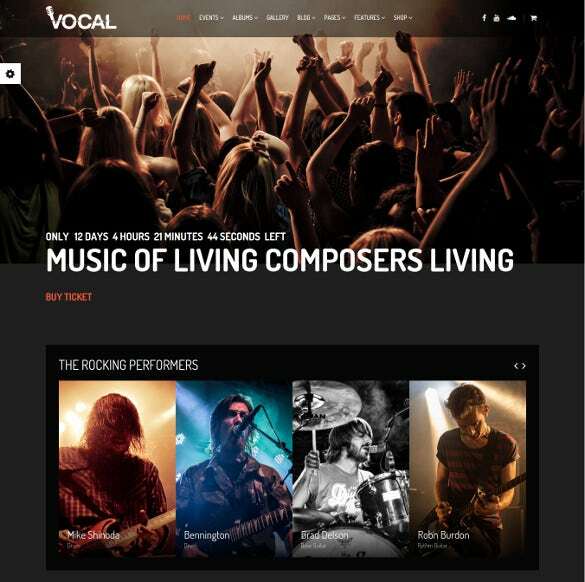 With this WordPress Theme you can take your music event to an entirely new level of brilliance. This is ideal for concerts as well. It looks modern and impressive. 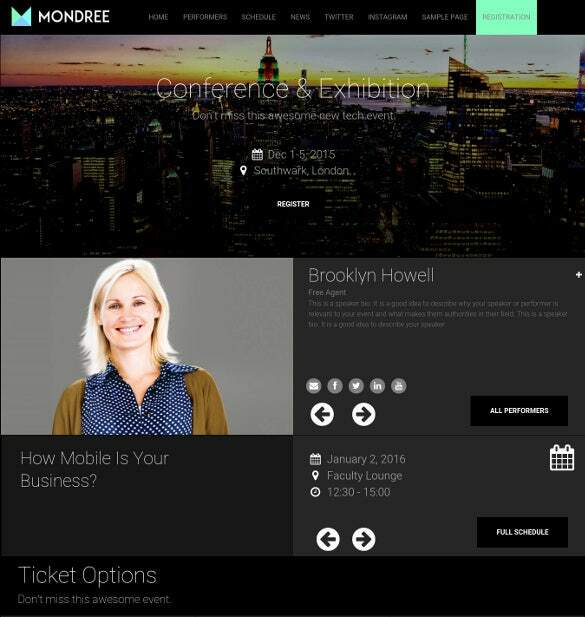 It has an all informative admin panel and the venue and date of the event at the bottom. 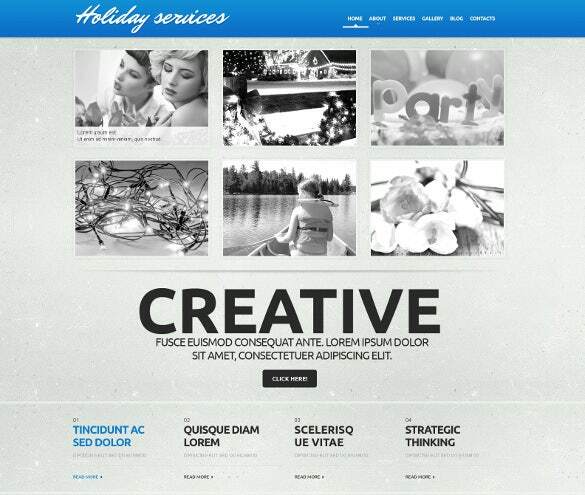 This theme has a uniquely stylish and very appealing aesthetics that graphically engages your audience, making it a perfect theme for planning holidays. It is ideal for holiday planners. 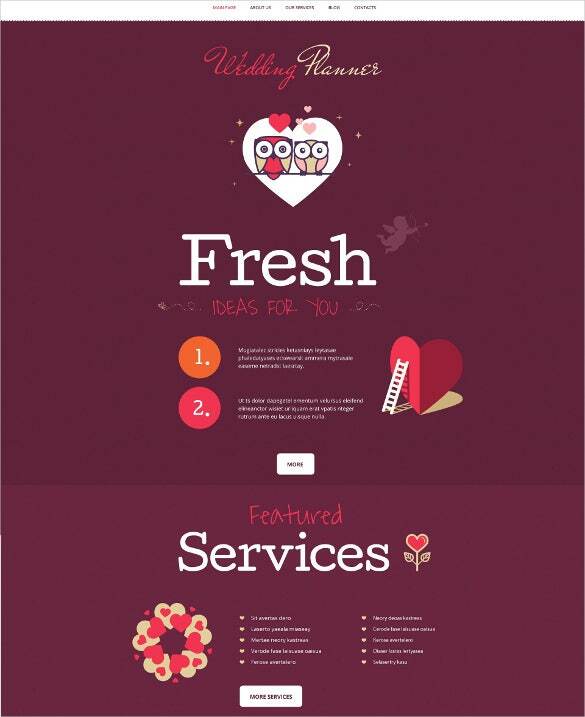 This has a lavish graphic based design and it ideal for wedding planners. 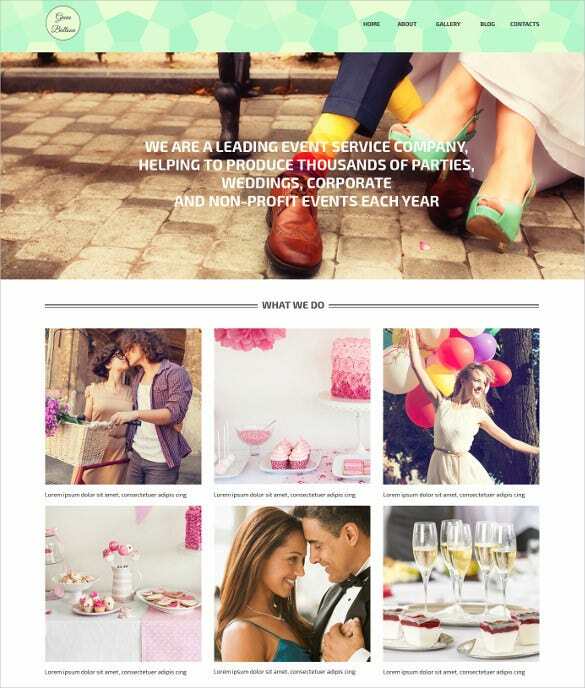 It is brimming with features and tastefully functional showcasing the various services offered by the planner, a link to Instagram, gallery etc. 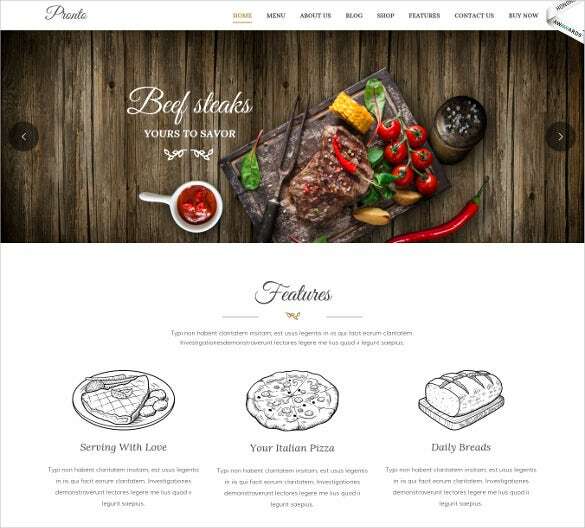 This is a WordPress theme for Restaurateurs and Hoteliers. 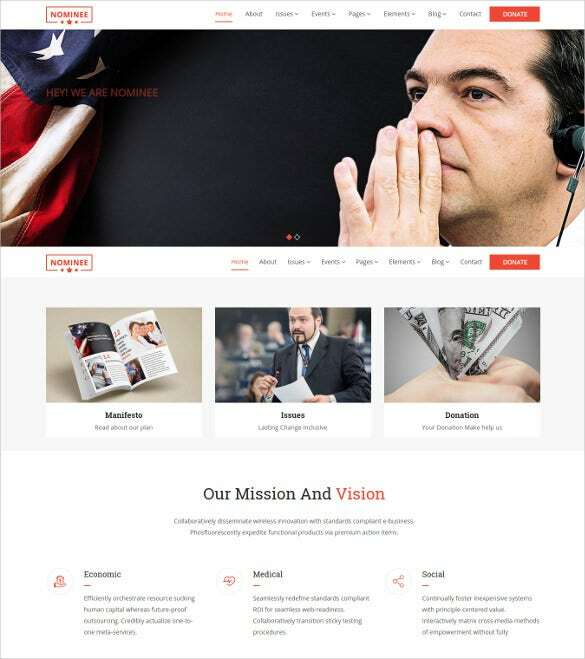 It is creative and powerfully pliable theme. It is customizable and has features like kinds of food offered by the restaurants, links to their shops, blog etc. 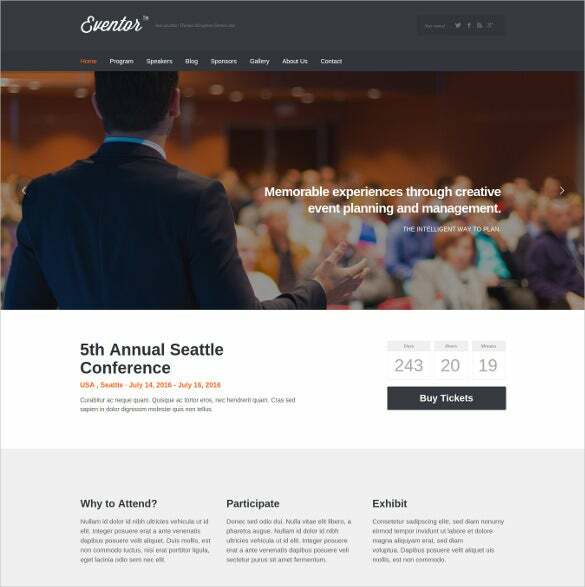 This event planner responsive WordPress template is made with event professionals in mind, has all the features for an event blog and is perfect for promoting both professional and personal events. This theme is incredibly vast and expansive and inherently diverse at the same time. It encompasses cutting edge technology and top of the line professional quality. It is graphic and has all the elements that one needs to organize business events. 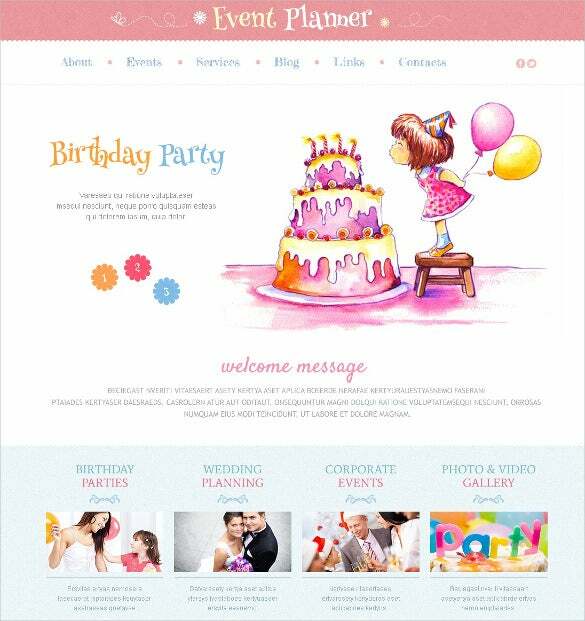 This is a modern, clean, responsive and highly customizable WordPress wedding theme designed and developed with simplicity and ease of use. 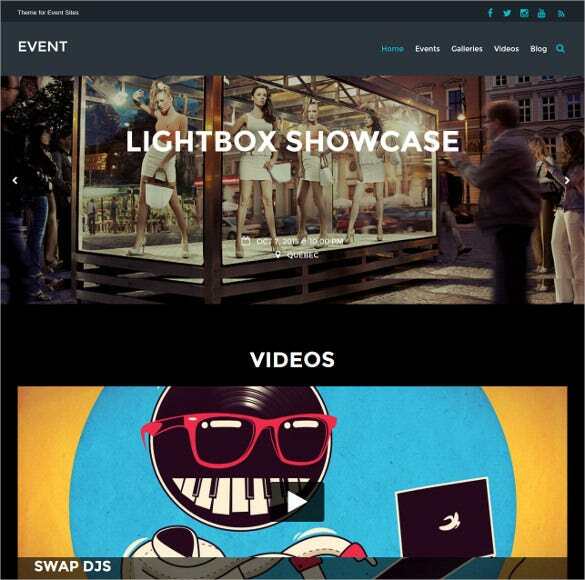 It can be used by any event manager organizing and managing all kinds of events. 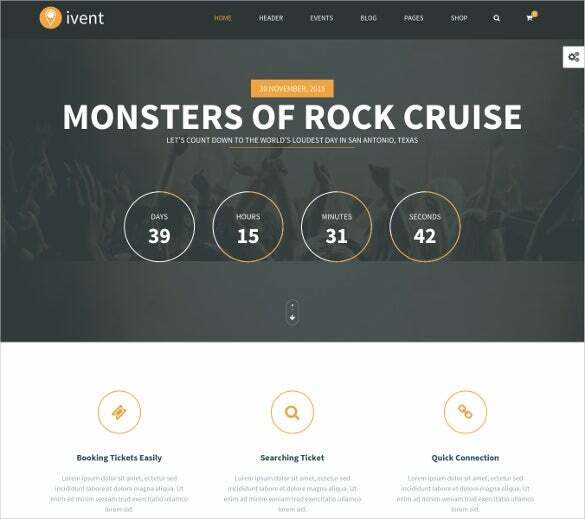 This is a graphic based WordPress theme for musical event organizers. It’s a sleek, modern interface with built-in sections for the information you need about the music band of your choice. 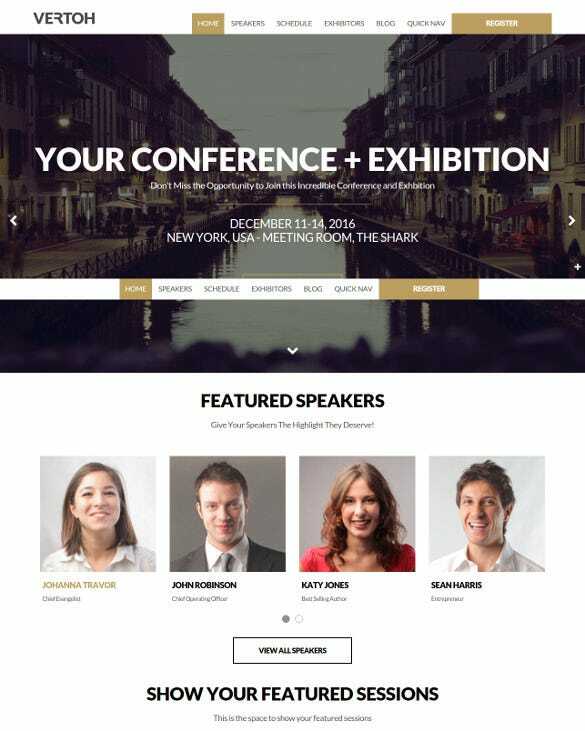 This is a wonderfully structured and visually attractive and extremely easy to use theme ideally for organizing premium events. The colour combination is formal yet balanced. It summarises the upcoming events in the calendar and highlights the key features too. 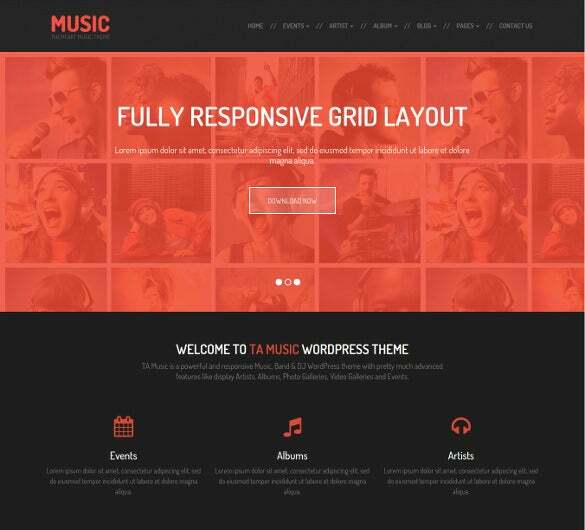 This is a theme designed for musical event organizers. It is graphically nimble and colourful; and fresh-faced and innovative. 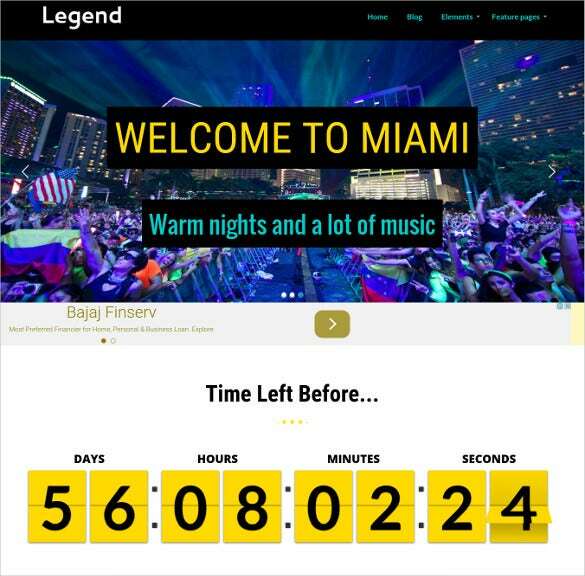 It is ideal for use in Night clubs to organize their events and gives a countdown to the main event along with other features. 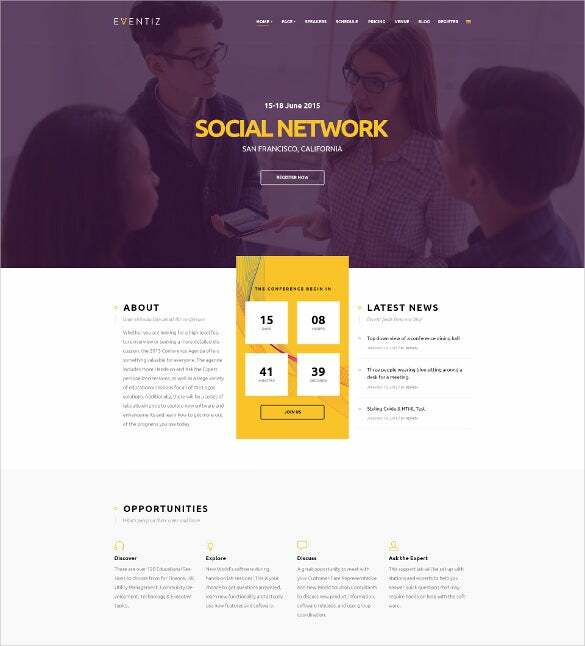 They come with a 2 step installation process after download and have multiple colour options and filterable portfolio.Accompanied by custom widgets like social sharing options and an advanced commenting system these themes allow you to reach out to your customers more. They not only offer a feature-rich Admin Panel but have On-line chat option and blog functionality as well.